Each year, I look forward to so many different dance performances but probably my most anticipated is the San Francisco Ballet at the Stern Grove Festival. A day filled with an amazing picnic lunch, great seats, and lively, engaging discussion with the most fun group of dance enthusiasts. What more could one ask for? Well of course, the performance (incidentally, the ballet’s only SF engagement between May and November) is the quintessential element of this one-of-a-kind experience. I have said this many times before with respect to San Francisco Ballet’s programming, and it is certainly worth repeating. Without fail, the company manages to present work that highlights their diverse repertory and the dancer’s artistic/technical acumen. Now, that doesn’t mean I like every piece, but I always appreciate their commitment to showcasing range and depth and the 2012 Stern Grove program was no exception. The San Francisco Ballet began with George Balanchine’s “Scotch Symphony” from their preceding season. I love this ballet, particularly because of its dynamic contrast: quick batterie against elegant adagio; playful allegro alongside emotional pas de deux. Nicole Ciapponi shone as the ‘scotch girl’. She successfully executed the vast array of footwork in the role, from the traveling brisés to stationary jètés to pliés on high demi-pointe. Ciapponi has the wherewithal to dance any style, any part, and this time, it was exciting to see her as a batterie/petit allegro soloist. Another standout performance came from within the “Scotch Symphony” corps. Dustin Spero has the regality and sharpness necessary for this ballet. Every movement was precise and exact, whether posing in a lunge or completing an entre chat six. He morphed into his character totally; projecting an advanced interpretation and understanding of this work. Maybe soon we will see him as one of the demi-soloists in Balanchine’s visual masterpiece. 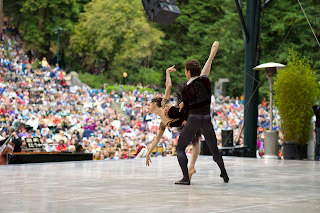 Two shorter ballets filled the middle portion of the program. The first, “Spinae”, choreographed by corps de ballet member Myles Thatcher and danced by SF Ballet apprentices and trainees, lived up to and even exceeded the expectations of its title. Thatcher fully examined every possible articulation, contraction and release that can be found in the spine. The sinewy syntax was so lush and developed that at times, it seemed that the dancers were literally swimming through space and Thatcher’s inventive running leaps are reminiscent of early Édouard Lock. The trainees and apprentices are truly fantastic technicians and performers – it was both a treat and an honor to see them dance on Sunday. Having said that, the men could use a little more attention to their demi-pointe; generally speaking, the arch of their feet is a little underdeveloped. Next came Hans van Manen’s “Solo”, danced by Gennadi Nedvigin, James Sofranko and Hansuke Yamamoto. The most interesting aspect of this work is how van Manen chose to mirror Bach’s music through the physical form. Each man embodied a different theme, seamlessly juxtaposing and layering, which is exactly what Bach was doing with the themes in the score. Much of Bach’s music has no stopping point, no cadence, until the end of the composition is reached. Similarly, Nedvigin, Sofranko and Yamamoto ushered each other on and off stage so that the movement also never stopped. van Manen captured the polyphonic texture through every playful interaction, and kept true to the compositional elements from the Baroque period - utilizing augmentation, diminution, sequence and inversion. “Number Nine”, Christopher Wheeldon’s colorful ménage, acted as the finale of the afternoon. Yet another example of the company’s diverse repertoire, this contemporary ballet featured four couples (who were well-suited both technically and visually), supported by a corps of sixteen. One of the four solo women, Sasha DeSola, is fast becoming a favorite of mine. She is an absolute delight to watch and has the technical chops to match – textbook fouettés, and her rond de jambe en l’air absolutely soars. Gennadi Nedvigin’s jumping entrance was super-human; he was almost horizontal to the ground and landed with such presence and composure. He definitely drew a number of audible ‘wows’ from the audience. Though I enjoyed the overall performance of this ballet, “Number Nine’s” choreography is just a little busy for me. Wheeldon has so many different pairings, sequences and variations happening all at once that the stage becomes a little schizophrenic. However, to be fair, he does pull the group together for the final moments, which for me, are the most cohesive of the work.